The resource type is a book and is identified as an eBook (because the url in its web address field is present in the eBook whitelist). NEW April 2019 - eBooks also now have an option to link to the OpenURL, however, will default to the web address unless overridden for the majority of users. The exception is that OCLC library catalogue users should expect the default to be the OpenURL and web addresses discarded at the point of bookmarking. The resource type is website or webpage. Where there are multiple web addresses, the View Online button will automatically point at the first web address but this can be changed. The resource is a Talis Aspire Digitised Content (TADC) digitisation. The View Online option cannot be removed in this instance unless the TADC digitisation is withdrawn. The View Online button will automatically appear for Articles. This can be optionally switched off if this is not the preferred behaviour at your University. Universities can choose which link is preferred when there are multiple link types in an Article. You can choose from Web Address, DOI and Open URL, in any order. For example, if you want web addresses to be preferred and never DOIs, then a preference order of "Web Address, Open URL" can be configured. The default order is DOI, Web Address and Open URL. Please contact Talis Support for more information. It is possible to manually enable the View Online button, and specify which of the possible links the button should send the user to. e.g. 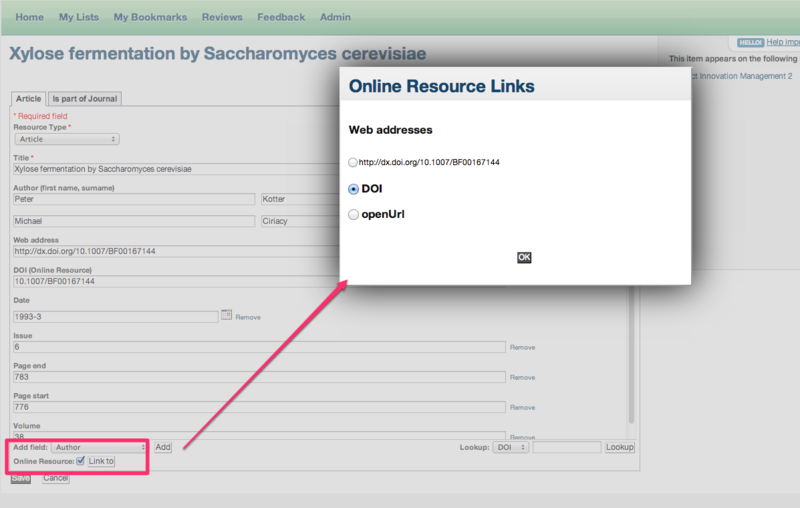 where the resource is an article, it may have a DOI link, a web address and an openURL link available - the new functionality enables you to specify which of the possible links the online resource should take the student to. If no preference is set, the button will use the first link found on the resource. When you tick the Online Resource box the "Link to" screen will pop up, with a link already ticked for you to confirm or change. So for instance: articles will use the Web Address if there is no DOI present and then finally Open URL if no other links exist. N.B View Online button refers to the new list view, previously known as the Online resource button in classic list view.